This month is a particularly good roundup. I had a ton of submissions, representing science themes from a wide variety of disciplines. Also a wide variety of baked goods. I have cookies, cakes, and even the first science themed cake pop! So our first post comes from Jackie of Food-ology. You may remember her from last months pie contest, she submitted the yummy savory pie (er pudding!). Love everything she submitted. I'm sure everyone will agree the mouse cake is fantastic. Though... is that needle-less syringe IACUC compliant? "To explain the photos... I was in a Cancer Biology program so I've got a mouse cake with a (cupcake) tumor. (Yes, that's a real syringe. But it's OK- there was no needle- and it was sterile!)" 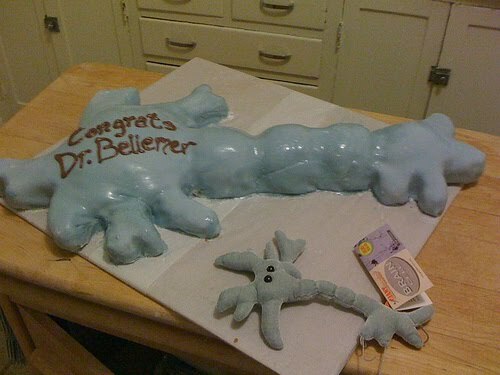 "I also have two cakes I made for two graduate students' qualifying exams: a cake with the life cycle of dictyostelium, since he was the first person in our lab to work on dicty, and a cake depicting the other student's thesis project on cell-cell adhesion." 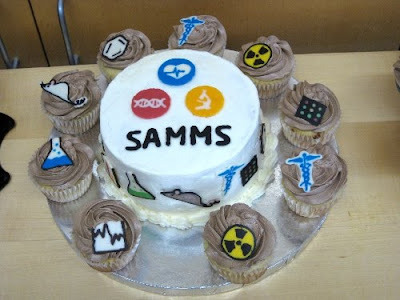 "Finally, I have bio/ med related cupcakes I made for the the Stanford Association for Multi-disciplinary Medicine and Science (SAMMS) club. 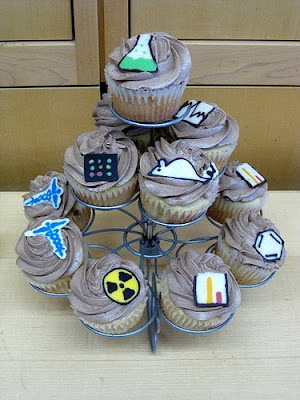 The chocolate decorations include: beakers, benzene rings, mice, graphs, radiation symbols, medicine logo, microarrays." 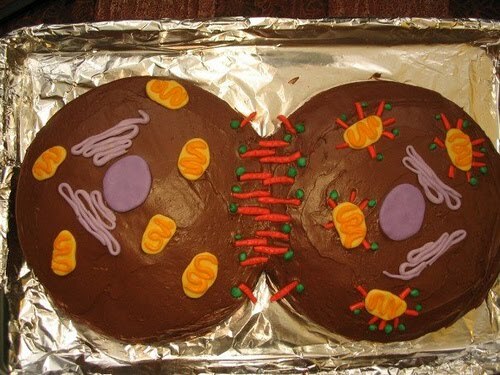 "FYI: I have the SAMMS decorations, demonstrating the chocolate technique, also on my blog here: http://food-ology.blogspot.com/2009/02/so-ive-been-commissioned-to-make-cake.html The final product is here." Cindy submitted our first batch of science themed cake pops! So happy to see the cake pop take a nerdy turn. "I love to make cake pops; so for the final exam in Organic II class, I made these methane pops for my student (thankfully they understood the molecule!)" Jennifer, a Chicago biology teacher sent in her gel electrophoresis cookies! 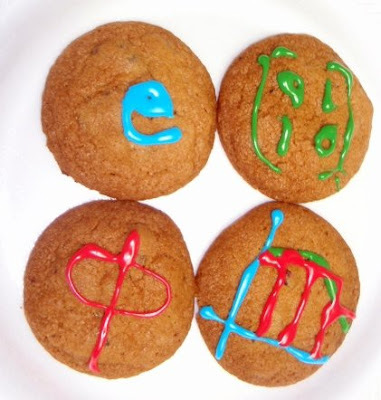 Penny sent in these sweet Emoticon cookies. I wish I had a chance to see the whole tray. Funny that only sad or rather nonplussed emotes are left uneaten. No one wants a sad cookie? 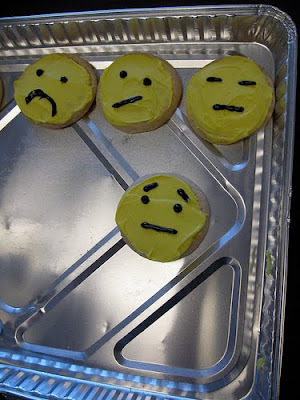 "Saw these emoticon cookies at the Literature.Culture.Media Research Slam at UC-Santa Barbara yesterday. I didn't catch the whole tray, only what was left toward the end of our session. Apparently the presenter (Zach Horton, a student at UCSB) brought a wide array of emoticon cookies." Emily, who also submitted a pie to last months contest (the chocolate cream pie several of you are very fond of) also sent me some mice cookies with her pie submission. 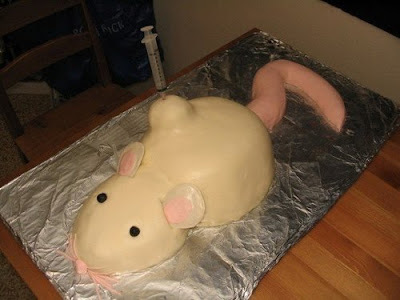 "I attached some lab rat cookies I made a few months ago - thanks for this idea! 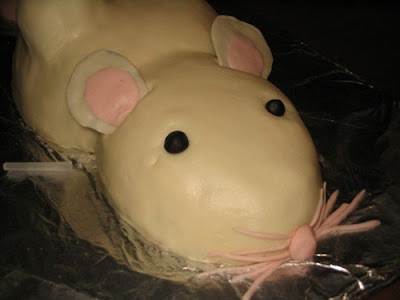 I loved it and my friend (who indeed works in a lab with rats) appreciated the cookie gesture." Catherine, a PhD student and a baker, sent me some fantastic cakes! My friend Stacey just defended her PhD in biomedical engineering. She makes nanoparticles that can be used in vaccines - she fills the nanoparticles with antigens and decorates the outsides with Toll-like receptor ligands. That way the immune system will easily recognize the nanoparticles and make antibodies against the antigens inside! Awesome! I made a vanilla funfetti cake (baked in a bowl) and decorated the outside with colored chocolate squiggles (ligands). Julie, Helie, and Melody sent me all these cookies. 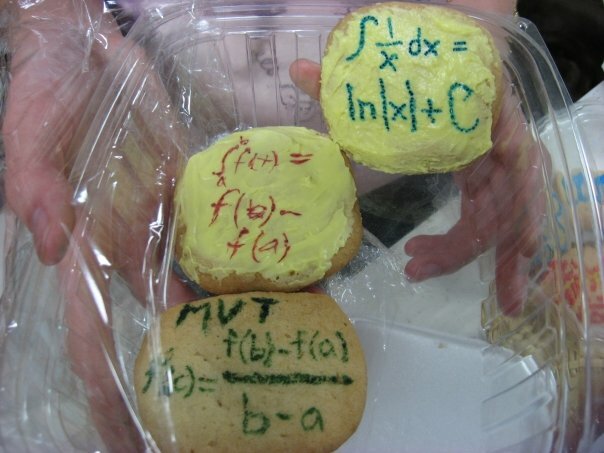 They went on a science cookie baking spree to give away to their teachers. My favorite have to be the calculus cookies. Math: Here we did e, phi, an matrix (which at first glance appears to be the identity matrix), and a graphical representation of a Riemann Sum. Chemistry: The ideal gas law, complete with the value of R for (L*atm)/(mol * K) and an atom. Our Chemistry teacher also happens to be a music teacher, so we included the music notes. 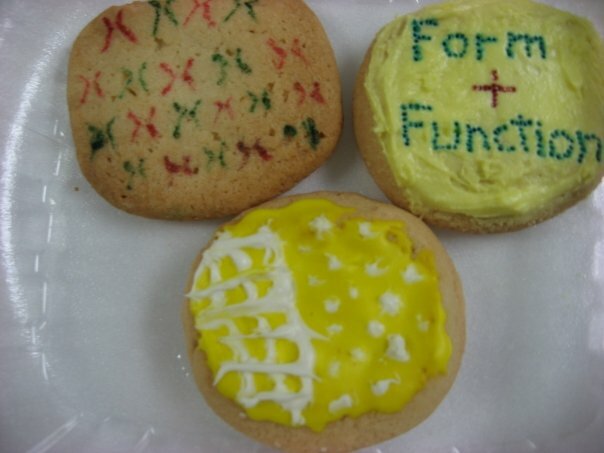 Biology: Our Biology teacher loves to emphasize the role of form and function in biology, so we, of course, had to include that on a cookie. The yellow/white is our attempt at a petri dish with some bacteria. The last one is a karyotype (male). 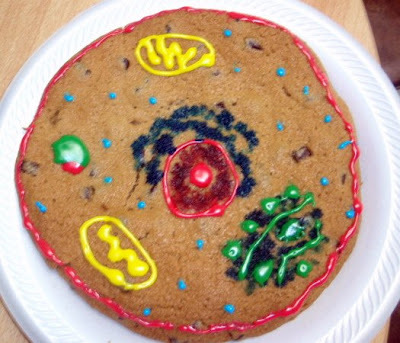 Animal Cell: This is our greatest success yet--the cookie _is_ actually the size of that paper plate. We have the nucleus, surrounded by the blue endoplasmic reticulum. There are also yellow mitochondria, the green/blue Golgi body, and light blue free ribosomes! The green/pink blob is our representation of phagocytosis. 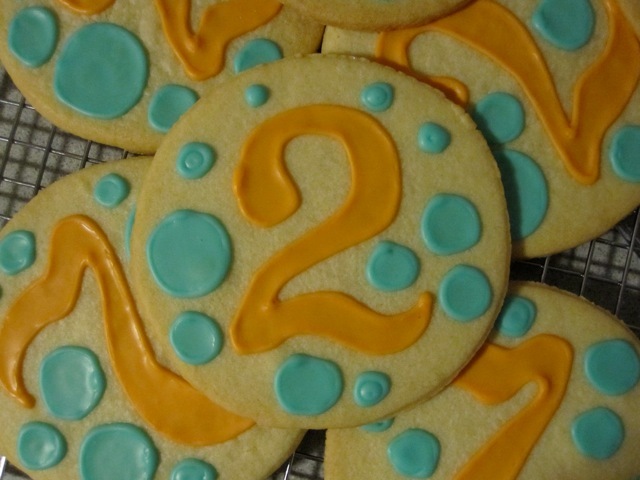 Science cookies are invading baby showers now! Deena made these beauties and did just a fantastic job on the icing. "There comes a time in life when it seems like almost everyone you know is having babies. At first, it kind of floors you every time you hear the news, and you struggle to come up with a gift commensurate to the occasion. 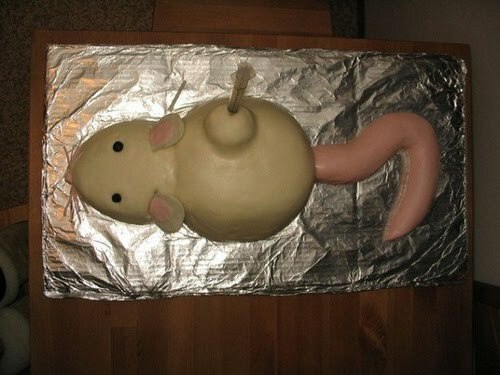 In years past, I crafted ornate homemade cards, cooked obscene amounts of food, and stitched patchwork quilts and a stuffed pink satin armadillo. But as more and more friends began to have babies, I realized that keeping up with that sort of gifting protocol could quickly become a second job. I started turning to the gift registry, pairing a cotton onesie with a heartfelt card and calling it a day. For the most part, this seems appropriate. But every now and then, I hear about the pregnancy of a friend who is so dear that the registry just doesn't cut it. I start looking around for a more personal way to share the love. And recently, I hit upon these baby shower cookies. "That's when sperm cookies are called for. Oh yes, that's right. Try to eat those in front of others with a straight face." Yes that is a sperm cookie. Try to eat that around others and maintain a straight face. I'm a sucker for anthropology cookies so I was pretty happy to see this set from Lauren, a lecturer and research assocaite at UC Santa Cruz, in my mail box. 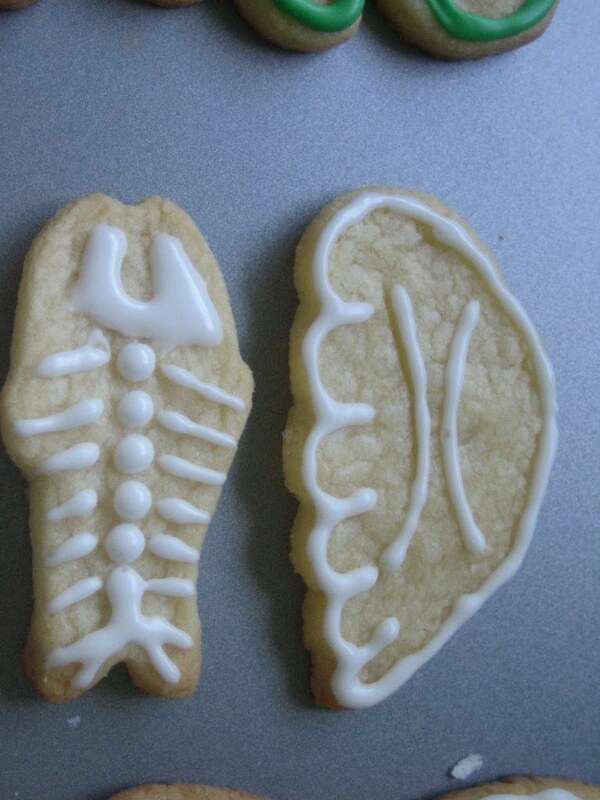 Homid fossil cookies! "I am a biological anthropologist who wishes she were a baker. I dabble in cakes and cookies, the occasional pie, but certainly nothing as lovely or fancy as those items that you spotlight on your website. 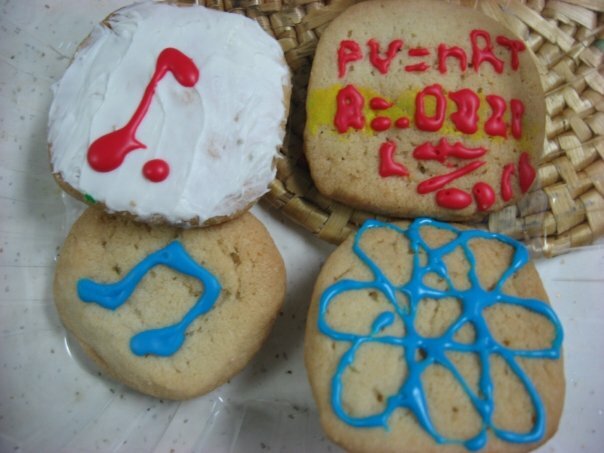 Nevertheless, the nerd in me just couldn't help not trying out some science themed cookies of my own. So I enlisted the help of a like-minded (i.e. nerdy baker) archaeology grad student in my department and we spent the day attempting to make some contributions for the science cookie #5 round-up. 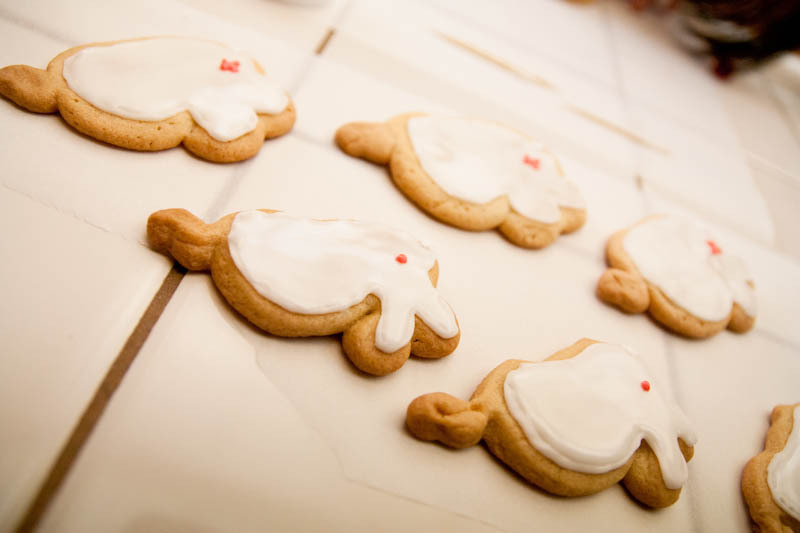 I must confess that we found the royal icing to be a bit of a royal pain. We couldn't really figure out the stiffness so we either made too stiff or too runny for the job required. Hopefully next time that will go smoother. We also had an issue with our icing dyes. I purchased some gel colors from Sur la Table thinking that they must be superior to the old liquid drops from Safeway because, well, they cost more. And were at Sur La Table. But the dye gets all over your hands when you open it, and then all over everything else, and took a lot of washing (and lemons and vinegar to remove). Do share your secret for how you color your icing and if it is these gel colors, how do you open them and add color without looking like you have been tie dyed? Rubber gloves, perhaps? "These photos represent homologous chromosomes that have just crossed over during Meiosis 1." "I have attached some photos of our first attempt. The first photo is a profile of the cranium of the newly described Australopithecus sediba (which I actually think is much more Homo-like, but that doesn't alter the cookie. But since you are a biological anthropologist, I thought some context may be important)." "Then there's a Darwin fish..."
"...and a skeleton representation of a javelina"
"And the last picture is where my cookie partner Cristie got really nerdy. She is a zooarchaeologist who specializes in fish bones. So there's a bony fish. And an otolith, which I learned is a bony sensory organ in a fish's inner ear that helps with balance. 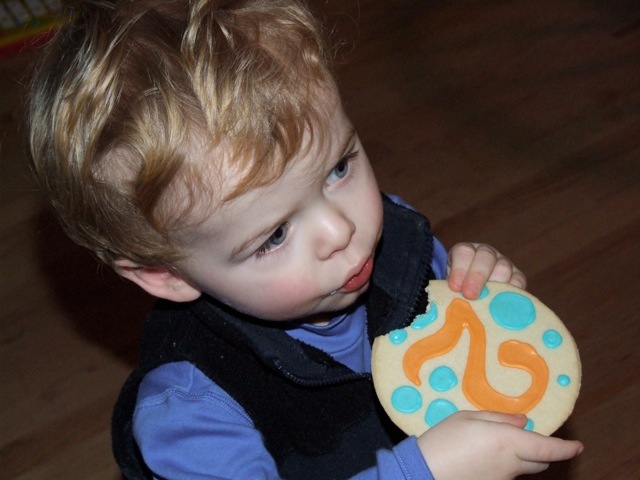 I'm sure that is the first otolith cookie to have been emailed in, right?" Yup! That is most certainly my first otolith cookie. Great set! Ruth sent me some really realistic mice cookies. I need to ask her how she gave the mice such a realistic furry texture. the mice from the proper research. 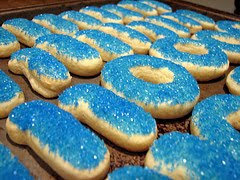 Definitely RA of http://definitelyra.wordpress.com/ sent me these sparkly binary cookies! "On Tuesday, JG’s AP computer science class took their exam, and it took me a while to figure out what I wanted to make for them. The test is on Java, technically, but I don’t know enough about it to make a witty joke, and I sure as heck did not want to write out lines of code. So, I opted to go basic and made ones and zeros, hoping they would get the joke. One problem: I aimed to make 3 dozen cookies and ended up with over 50, and there was no way I could outline and flood that many cookies after work in time for the next school day. 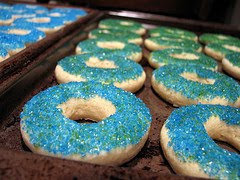 Instead, I decided to experiment by covering them with sparkly sanding sugar." "... I found myself quite taken by the design of the Ishihara color blindness tests I remember doing as a kid (I was particularly inspired by #12, found here: http://en.wikipedia.org/wiki/Ishihara_color_test. I was thinking of doing the invitations with this design, but MY GOD, all those dots." "So, I thought, let's do cookies and EAT THEM instead." "I freehanded all the 2s, then did the dots around them in the contrasting color. Used your instructions and everything. 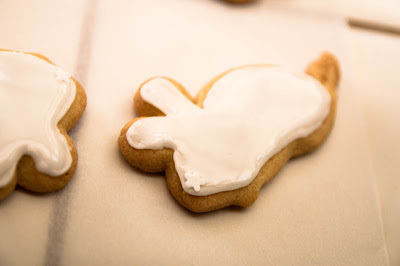 My first time with this method of frosting cookies. Learned a lot. THANKS for the help!" Isn't that just the cutest little boy?! I think I got everyone in this month's round-up. If I missed you, email me at notsohumblepieblog@gmail.com. 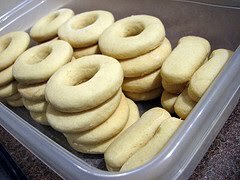 If you would like to be in the next round up, shoot me an email with your baked goodies. Everything looks amazing! I need to find the time to make some cookies and send in some pics! WOW!!! That mouse with a syringe!!! Veeery creative! Oh wow the mouse and the methane pops and the neuron and the antigens! I love science mixed with cookies. 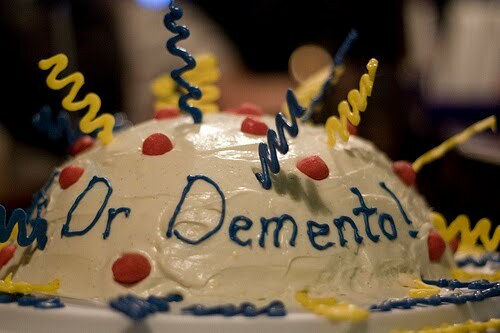 And cakes. Nom. That's not a medical symbol, that's a Caduceus. The medical symbol has no wings, only one serpent, and is called the Rod of Asclepius. Though it is a common mistake. Even the US Army Medical Corps use a Caduceus. Oh, I forgot to add...right or wrong it's beautifully done! Haha. I love this "brain food"! I must be a nerd- I recognized dictyostelium right away. Fabulous job! There is such an array of fabulous creativity in all of these. I love that you put these together :) Science cookies rock! That mouse with the needle in it is disgustingly hilarious. 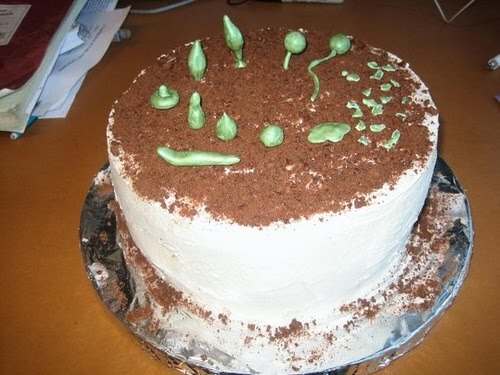 And here I thought sperm couldn't get anymore appetizing!